The aftermath of clear-cutting is an ecological horror story. The Carmanah Valley is one of the last areas of old-growth forest left on Vancouver Island and is home to a spectacular stand of Sitka spruce. But it is also threatened by big logging interests which have already clear-cut much of the surrounding rain forest. To help publicize this, the groups working to preserve the valley invited me and a number of other artists to go there are record our impressions of the forest. On our way to the valley we passed through areas that had already been cut down. Their appearance was shocking; nothing was left but stumps. 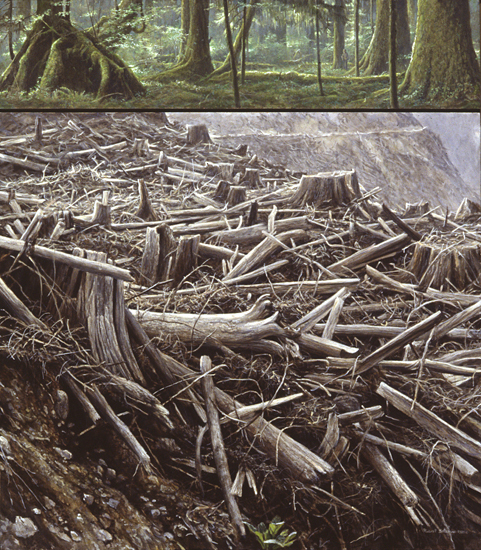 In contrast to this scene of desolation is the lush, old-growth rain forest of the top panel. The human figure (me) is present to give some idea of the scale of the trees, but also to say that although humans do threaten these forests, there are many people working to preserve them.